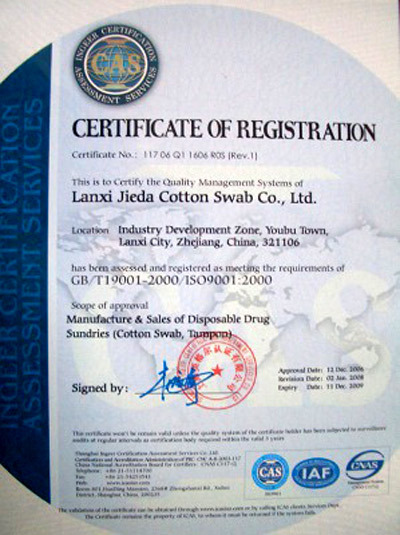 Company Overview - Lanxi Jieda Cotton Swab Co., Ltd.
11YRSLanxi Jieda Cotton Swab Co., Ltd.
Lanxi Jieda Cotton Swab Co.,Ltd founded in August 1998 by Mr. Jiang Liangqing,at that time the name is Lanxi Jieda Cotton Stick Factory. initially, only three machines and15 staffs,supported by its ever growing customer base and our constant technological innovation, our company gradually develop and expand to one of the leading position for specialty manufacturer of cotton swabs in China. product range:plastic stick cotton swabs,paper stick cotton swabs and wooden stick cotton swabs, different packaging forms reach to more than 60 kinds.our company started produce blister cotton swabs for U.S.A market in 2003, the brands include:TARGET, KROGER, DG,LEADER,COTTONTAILS,MEDICINE SHOPPE,SOFETTS,CAREONE,UP&UP etc.so,we have accumulated rich experience in blister packaging cotton swabs.our company's target is to produce the best quality and most favorable price for our customers. Starting in 2004 our company successfully opened up the Japanese market and European market, became cotton swab suppliers for several large retailers.currently 90% of our products are exported to United States, Japan, Canada, South Korea, Germany, Spain, Italy, Belgium, Hungary, Mexico, Colombia, etc.Company is committed to continuous improvement of product quality so can get a stable customer's approval. now our company currently working to expand production capacity, and efforts to promote automation tipped and automatic packing production line to power. We are professional cotton swabs manufacturer and ready to cooperate with partners around the world.